The handy Guerrilla Painter Plein Air Collapsible Umbrella was designed by a plein air painter with firsthand knowledge of what an artist in the field really needs. Measuring a mere 12" (30 cm) when collapsed and weighing 1.3 lb (0.59 kg), this light, portable painting companion can be easily stored or carried wherever you need it. When fully open and extended, the Plein Air Collapsible Umbrella measures a full 34" (86 cm) in height. Its 42" (107 cm) wide, 8" (20 cm) deep canopy creates ample shade for your easel, canvas, and you. A gooseneck multi-mount provides added stability. 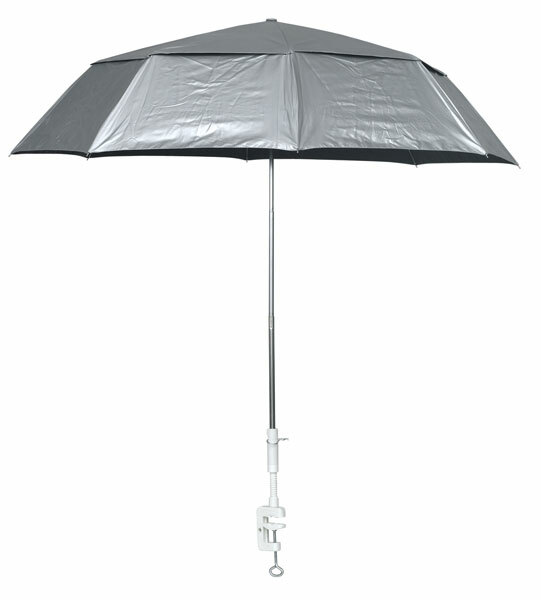 The umbrella's silver exterior reflects heat and ultraviolet rays, and its underside is black in order to reduce glare on your palette and canvas. A wind venting feature allows for use in a slight wind or breeze. A C-clamp and instructions are included.